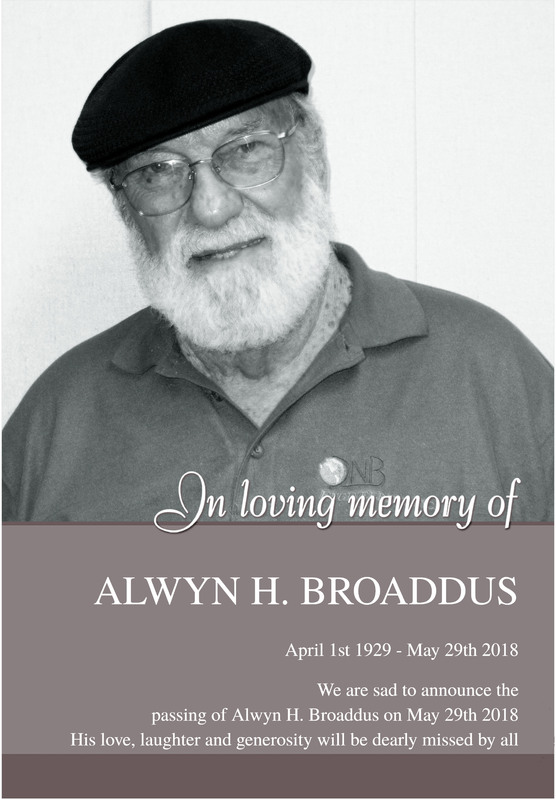 Sad Announcement:The Passing of Alwyn H. Broaddus, the founder of DNB Engineering, Inc.
We are extremely sad to announce that Alwyn Broaddus, our beloved Founder of DNB Engineering, Inc., passed away on May 29th, 2018 at the grand age of 89. His inquiring mind and innovative spirit will live on as a legacy through the company. Alwyn was deeply loved by his family and friends and there are no words to describe the loss that will be felt by his passing. He was a US Marine, EMI/EMC Pioneer and brilliant engineer. In the amateur radio world, Alwyn was well known as W6EMC and K6GIZ. Those of us who had the opportunity to work with him will also feel a tremendous loss. Mr. B put his heart and soul into his company. He was a remarkable leader; very talented, an extraordinarily intelligent and accomplished entrepreneur who started DNB Engineering, Inc. in 1979. The company has since become a global leader in compliance testing and engineering services that is operated by his sons Doug Broaddus and Bryan Broaddus. We warmly thank Mr. Broaddus for what he has meant to all of us. We are privileged and grateful to share the wonderful memories, passion, humanistic values and love, and evolution of DNB Engineering, Inc. He will continue to live on, through us. To his family and friends, we wish to express our condolences, love and everlasting admiration for an outstanding and amazing human being. DNB Engineering, Inc. is pleased to announce an exciting new service. Our Anaheim (CA) facility now offers HALT & HASS (Highly Accelerated Life Testing and Highly Accelerated Stress Screening) new product test methods. HALT (Highly Accelerated Lifecycle Testing) and HASS (Highly Accelerated Stress Screening) methods can be used in a variety of industries, including electronics, computer, medical, aerospace and military and helps to identify weaknesses in design or production. Both HALT and HASS are important test methods to use before a product has been introduced into the market. The benefit of these methods for the customer is the ability to achieve stress level results quicker than with conventional environmental test methods. What is HALT and HASS? HALT, or Highly Accelerated Life Testing, is a testing process often known as Destruct Testing. During the HALT test, components and /or assemblies are subjected to rapid temperature ramp rates and six axis random vibration stresses which gradually increase until such time as there is a failure. This failure is identified as a weak point in the design or material used. Once identified, product and material changes can be to rugged the product to improve overall quality. Often, these changes will improve the overall design and reduce the time spent in the development phase of the product life-cycle, effectively speeding the product’s time-to-market. HASS, or Highly Accelerated Stress Screening, is a testing process that is performed on components and finished assemblies. HASS tests do not stress products to their destruct point. Instead, HASS testing identifies the upper and lower operational range of a product and allows for the opportunity to increase the operational range well beyond the product’s expected lifetime operational stresses. 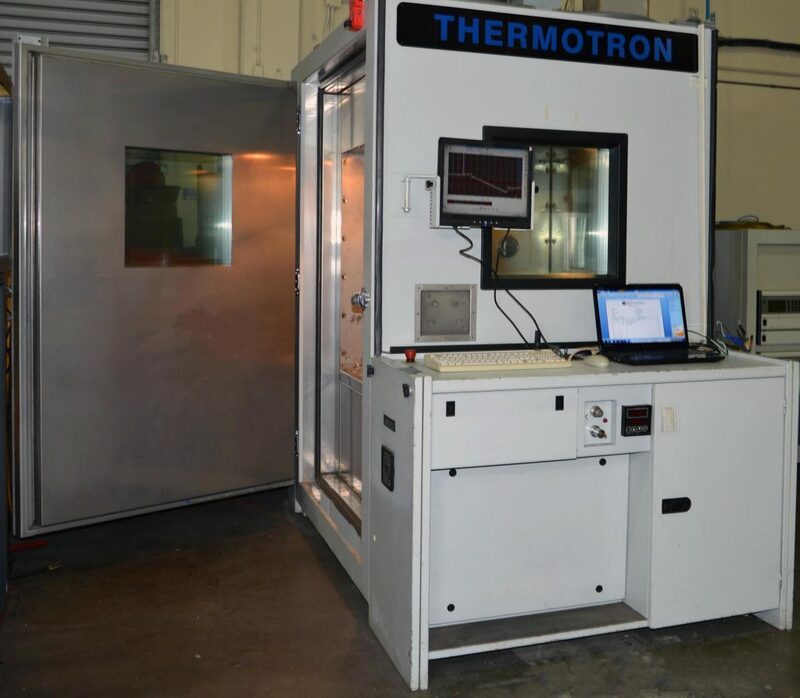 HALT and HASS testing at DNB Engineering, Inc. use the environmental chamber with the ability to combine both temperature and random vibration inputs. DNB’s experienced engineers will provide full support, quick setup and running HALT & HASS tests on your product to get fast results. Our goal is to help customers to bring their product of world-class quality to market in the shortest possible time at the least cost. Contact us today to discuss your program or get your Free quote by following the link. 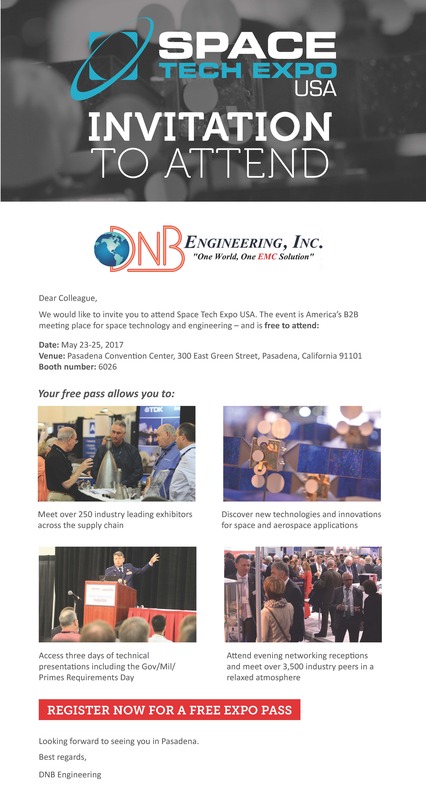 DNB Engineering, Inc. will be exhibiting at the Space Tech Expo USA on May 22-24, 2018. The show starts May 22nd and will run through May 24th at Pasadena Convention Center, CA. Space Tech Expo will be returning to Pasadena for 2018. America’s engineering and manufacturing meeting place for space technology grows bigger and better year on year, bringing together industry leaders, decision-makers and buyers to meet the engineering and manufacturing supply chain for commercial, civil and military space. DNB Engineering, Inc., is a full-service test lab that has been family-owned and operated since 1979. The company provides unrivaled EMC, Direct and Indirect Lightning, HIRF, Environmental, Product Safety and Regulatory Testing services. DNB will be at Booth #6026 so please make sure to stop by and visit with us! To get a FREE exhibit hall pass, click the picture as below. DNB Engineering, Inc. will be exhibiting at the Del Mar Electronics & Manufacturing Show (DMEDS) on May 2 & 3, 2018. The show starts May 2nd and will run through May 3rd at the Del Mar Fairgrounds in San Diego, CA. The yearly tradeshow brings together manufacturers, distributors, and other industry players for training and networking. Del Mar Electronics and Design Show covers electronic components, fabrication, design and most aspects of electronics manufacturing. Over 4500 Industry Professionals. The upcoming edition of this event features technical sessions, a panel discussion, a plenary session, seminar, and a technology corner for exhibitors. This event will be a golden opportunity for the visitors to exchange information with the international leading organizations in the Electronics & Electrical Goods industry. DNB will be at Booth #730 so please make sure to stop by and visit with us! To get a free exhibit hall pass, click HERE!!! 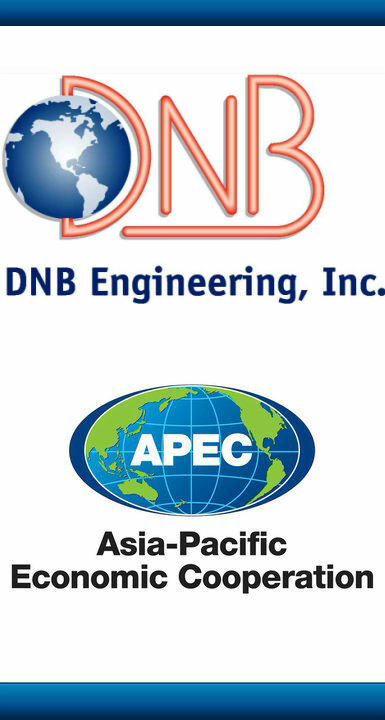 DNB Engineering, Inc. is pleased to announce their laboratory is now recognized to act as a Conformity Assessment Body (CAB) of the Asia Pacific Economic Cooperation for Telecommunications Equipment Mutual Recognition Arrangements (APEC Tel MRA). Strategic collaboration with National Radio Research Agency (RRA) allows DNB Engineering, Inc. to test and generate test reports accepted by the Korean Government. With this Accreditation (IN: US0090) DNB Engineering, Inc. streamlines compliance with Korea’s EMC requirements. This Accreditation will aid manufacturers with the specific technical regulations, standards, testing and certifications for the Asian Markets. Being involved in reaching Korea, as one of the world’s leading R&D centers and advanced technological customer markets, highlights the most recent method DNB Engineering Inc. serves customers compliance needs for EMC, Lightning & Product Safety testing services for nearly 40 years. 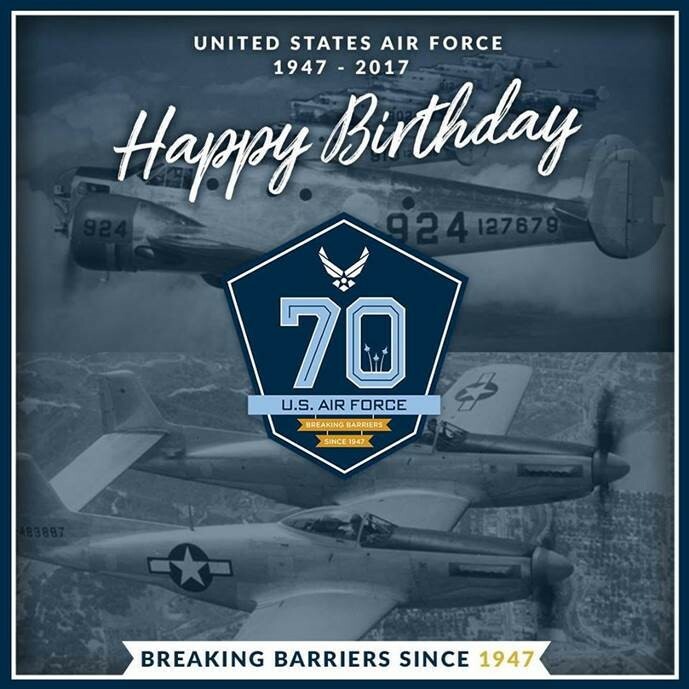 DNB Engineering Inc. wishes United States Air Force a Very Happy 70th Birthday! Thank you for all that you do for our country. The USAF is the largest and one of the most technologically advanced air forces in the world. 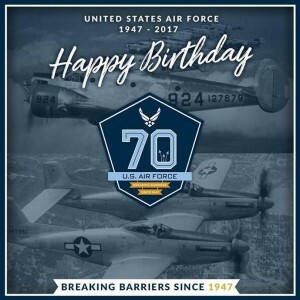 The mission of the United States Air Force is to fly, fight and win—in air, space and cyberspace. As of 2017, the service operates more than 5,369 military aircraft. Combat aircraft, such as Fighter aircraft, Bomber aircraft, Attack aircraft, Electronic warfare aircraft, Maritime patrol aircraft, Multirole combat aircraft and non-combat aircraft, such as Military transport aircraft, Airborne early warning and control, Reconnaissance and surveillance aircraft and Experimental aircraft. DNB Engineering Inc., as a world leader in EMC certified testing services, has been a part of just about every major Military program in the last 35 years. To learn more about DNB’s service, programs and locations, please visit our website. DNB Engineering Inc and Ophir RF Inc Will Be Exhibiting at the 2017 IEEE EMC Symposium with SIPI – Washington, D.C. This year DNB Engineering Inc. together with Ophir RF Inc. company exhibit at the 2017 IEEE EMC Symposium with SIPI – Washington, D.C.
We are inviting you to stop by at the Booth # 709 to discuss designing and developing capabilities of an extensive range of EMC products including Transient Generators, Indirect Lightning Generators, LISN’s, Current and Injection Probes, Loops, Transformers and Audio Amplifiers. Core products include RF Amplifiers from 10 kHz and 40 GHz up to 25KW. This Symposium on EMC+SIPI is the leading event to provide education of EMC and Signal and Power Integrity techniques to engineers of all backgrounds. The Symposium features five full days of training, innovative sessions, interactive workshops & tutorials, experiments & demonstrations, and social networking events. And now you can pick how you’d like to attend – in person or online! For more details about Ophir RF Inc., check the website @www.ophirrf.com. 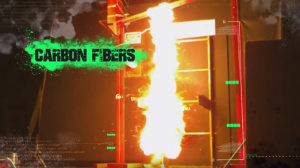 DNB Engineering Inc. is proud to be a part of amazing Outdoor Channel series, Survival Science, where every episode, the adventure, excitement, pyrotechnics, and danger are real! Nick Mundt and Laura Schara together with Bryan Broaddus, The President at DNB Engineering Inc. company were exploring how dangerous the Lightning can be as one of the most powerful natural phenomena and what to do to survive. Some “explosive” experiments, they’ll determine the power lightning and how it behaves. And they’ll find out how can hunters and fishermen best protect themselves? 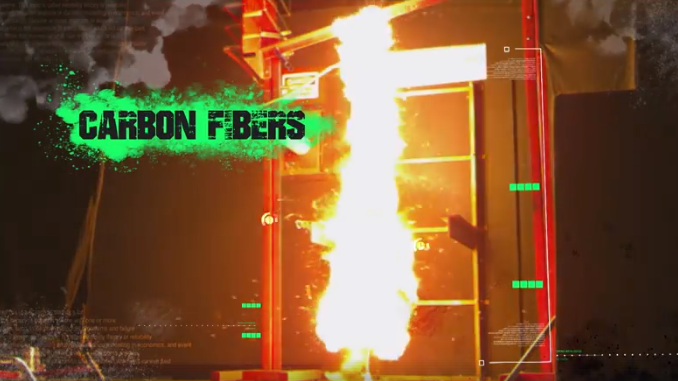 Check out an electrifying episode of Survival Science that was filmed at DNB Engineering, State-Of-The-Art Direct Effect Lightning Facility. Watch it Tonight, July 24th, at 9PM on the Outdoor Channel! DNB Engineering continues to lead the industry in Direct Effects Lightning Testing with their unrivaled capabilities, which include: High Voltage Attachment Testing (3.0MV Marx Generator), Swept Channel Attachment Testing, High Current Physical Damage Testing (Component A, B, C, D), Structural Testing, Component Testing and Fuel System Testing. The Direct Effects Lightning Test Facility is located at 2311 W La Palma Ave, Anaheim, CA. 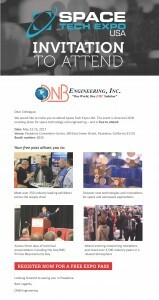 DNB Engineering, Inc. is excited to participate and exhibit at the 2017 Space Tech Expo. The event will take place in Pasadena, California from May 23-25, 2017. In its sixth year, Space Tech Expo and Conference 2017 continues to grow in its new venue in Pasadena. As America’s engineering meeting place for space technology, the exhibition draws the attendance of thousands of industry leaders, decision makers, engineers and buyers to meet manufacturers and the supply chain for civil, military and commercial space. DNB will be at booth #6026 so please make sure to stop by and visit us. Registration is free to walk the exhibit so sign up today. Click here to register now! For more information about DNB Engineering, Inc. and our testing services, please call (714) 870-7781 or visit our Website. 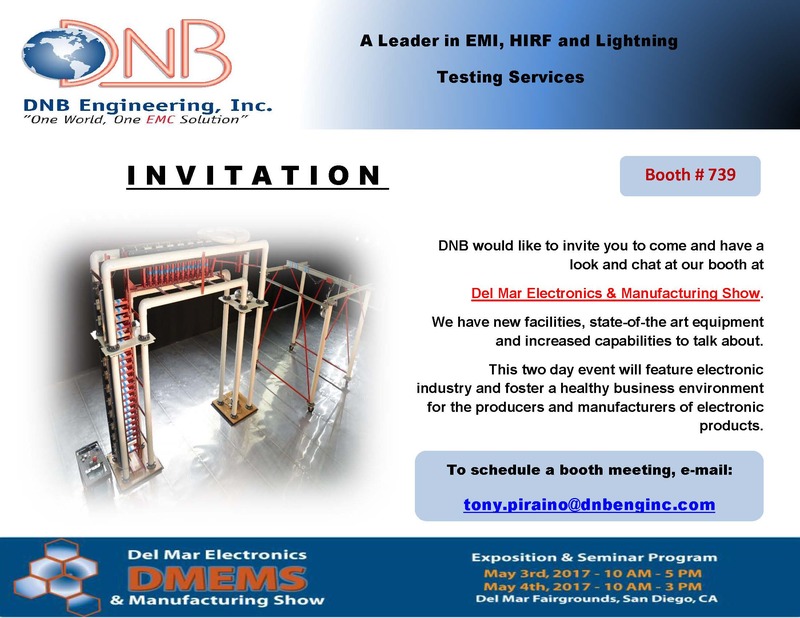 DNB Engineering, Inc is pleased to announce our participation at Del Mar Electronics & Manufacturing Show, between 3-4 May 2017, in Del Mar Fairgrounds, San Diego, CA, USA. We look forward to meeting current and future business partners at our booth 739.If you would like to arrange an appointment to speak to one of our representatives, please contact Tony Piraino. To register and get an exhibit hall pass, click HERE!